Sturnus. L 7 1/2 inch. Color a light brownish black all over, the feathers edged round with a lighter shade of brown. Bill strong, 1 inch long. Lower m[andible] straight, upper m[andible] compressed, rather curved & slightly notched atthe tip. Nostrils at the base oval. Tongue at the extremity bifid. Tail short, 12 equal f[eathe]rs, rounded at the tips. Legs strong, outer toe not connected with the middle. Iris yellow. But his notes were not examined by ornithologists for quite some time and, when they were, they were not recognized for their value. This is because he had handed them off to a Mrs. Maria Graham, who published a horrible account of the voyage that leaned heavily on Roland Bloxam’s diary and Andrew Bloxam’s notes. (Roland was Andrew’s brother and served as the chaplain during the voyage.) By the time they were looked at as a primary document it seems that most who saw them did not recognize the connection to the Mysterious Starling or their value in general. The British Museum contains a good number of specimens, showing little variation, and all from New Caledonia. A specimen marked Aplonis mavomata, but without any reference, differs from A. caledonicus in having the plumage dingy brown, without any gloss, the feathers ofthe underparts narrowly margined with grey. This may prove to be the young of A. caledonicus, but no locality is given. To confuse things even further a later voyage to the Cook Islands (Cook’s second voyage) resulted in a drawing of a starling by Georg Foster which some tried to say was the same species as Bloxam’s bird. This was repeated in the literature for quite some time despite rather obviously being untrue. Well, obvious if you had access to both the specimen, Bloxam’s notes, and the drawing, which most people did not have. We saw quantities of rats with long tails, different in appearance from the common South Sea rat and resembling in color and almost in size the Norway rat. We saw them running about the wood in great quantities. Extinction is forever. A species, wiped off the earth, never to exist again. What a horror! What a disaster! What a wrong! It is correct, of course, to think of extinction this way during the Holocene Extinction, which we are living through right now. After all, the extinctions have occurred, are occurring, and will occur because of us, people. We have so altered the earth – pumping pollution, moving species around, destroying ecosystems – that many species, dependent upon ecological niches or simply unprepared for an onslaught of unfamiliar organisms with which they did not evolve, have no chance. It is depressing and angering and just wrong. But, in the wider view of things, extinction is necessary. It is what drives evolution. Extinction is what befalls the species that fails to adapt, to survive, to thrive. Most species go extinct. That is just the hard, cold reality of nature, red in tooth and claw. This is not to say that we should sit back and let the Holocene Extinction continue. No! We must fight to save every species we can, every ecosystem, every niche. It is the 100th anniversary of the extinction of the Passenger Pigeon, once one of the most abundant species in the world. In order to raise our awareness, to remind us of what we have lost, and to inspire us to fight for Every. Single. Species. 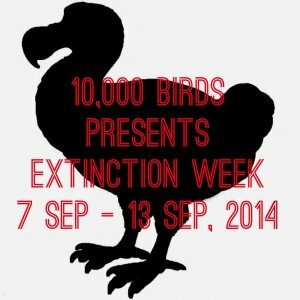 we are hosting Extinction Week here on 10,000 Birds from 7 September to 13 September. Come back, click through, read, learn. And get angry and take action. To Drill, or Not to Drill? That’s the Wrong Question.